You'll be able to find the list here for reference, or in the "Kotaku's favorites" channel in the Indie Game section of Xbox Live's Games Marketplace. Hypership Still Out of Control (80 MS Points): Hypership Still Out of Control is a retro-styled shoot 'em up that puts heavy emphasis on speed. Your ship will almost always be moving faster than you'd like it to, and that's where the fun and challenge of the game comes from. Well, that, and the four-player multiplayer. 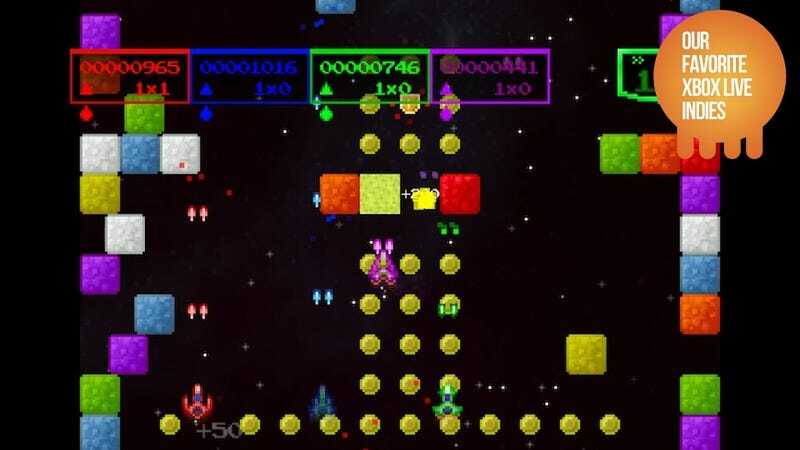 Sequel to Hypership Out of Control, Hypership Still Out of Control features updated graphics, a new wave to conquer (bringing the new total to 10) and four game modes. For a dollar, you can't go wrong with Hypership. Rainbow Rapture (80 MS Points):Rainbow Rapture stars the most adorable murderous cloud you'll ever see. You control the rainbow-trailed cloud (named, you guessed it, "Rainbow") as he blows through city after city, devouring whatever tiny people are in his path. The object of the game is to get Rainbow to go as far as you can. People, air-time and explosions from vehicles help keep him going. The visuals are simple yet pleasing, and the gameplay is fun and addicting. Block Zombies! (80 MS Points): Channeling equal parts Zombies Ate My Neighbors and I MAED A GAM3 W1TH Z0MBIES 1N IT!! !1, Block Zombies! is a top down, twin-stick shooter which features upgradable weapons, a handful of different enemy types and collectible power ups. Despite repetitive gameplay elements, Block Zombies! is undeniably fun. It may be the appeal of zombie hunting to fully upgrade a weapon, or the colorful block graphics that are pleasing to the eye, but something about this game makes it incredibly hard to put down. Ocean Drive Challenge (80 MS Points): Heavily influenced by Sega's OutRun, Ocean Drive Challenge is a driving game straight out of the 80's. The game has music that is dancey and chock full of synth and characters that dress like they came out of a John Hughes movie. The gameplay is pretty standard to driving games—different buttons for gas, brake, and changing gears. The thing that stands out about Ocean Drive Challenge are the visuals. Although heavily stylized, this game is capable of producing off-moments of pixelated beauty. Lots of Guns (80 MS Points): Lots Of Guns is quirky little platformer. You control a little potato-looking guy who is plopped into an enemy-infested world where the screen is always moving upwards, meaning you have to keep jumping up on different platforms to avoid dying. At a certain height, you will have the choice to select one of two different types of guns, which you'll be stuck with until you get to the next point where you have to make another choice. The object of the game is to get as high as you can. Even though it's a simple game, Lots Of Guns can be unforgivingly tricky at times. When you're at a height where there are more enemies than places to jump and your only two options for weapon are "pistol" and "dual pistol," you know you're in trouble. EvilQuest (80 MS Points): If you're in the mood for an action JRPG that feels like it could be at home on the Super Nintendo, then EvilQuest is for you. EvilQuest puts you in the shoes of Galvis, the most evil being in the land of Camelia, after he's been captured and imprisoned for trying to take over the world. The game plays like your typical RPG; you have magic spells, items, equipment, and different weapons that you can charge to shoot long range attacks (think Crystalis or Legend of Zelda). EvilQuest is surprisingly deep for a game that only costs $1. If you have an old school itch that need scratching, give it a whirl.